The Parlor Room Theater Company returns to their comedy roots this year with a new production of Larry Shue’s The Nerd opening July 17 at the Bishop McNamara Fine Arts Theater. This two-act comedy was written in 1981 for the Milwaukee Repertory Theater, where Shue was the playwright in residence. In that first production, Larry Shue originated the role of the protagonist Willum, which is not a surprise as that character’s backstory slightly mirrors that of the playwright, who lived for a time in Indiana (where the play takes place) and served in the Vietnam War. The play was a hit in its West End run before its transfer to Broadway in 1987, where it enjoyed over four hundred performances. The play was developed into a sitcom in 1989, but was never produced beyond the pilot episode, which closely follows Act 1 of the play. The Nerd by Larry Shue, presented by Parlor Room Theater. Running through August 3. 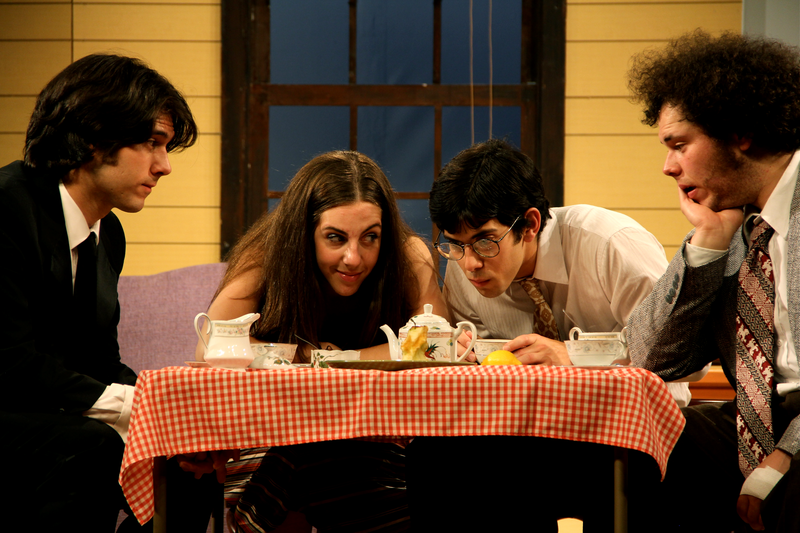 L-R: Frank DiSalvo as Axel, Amy Horan as Tansy, Dillon DiSalvo as Rick, and Thomas DiSalvo as Willum. Photo by Meagan C. Beach. The curtain opens to up-and-coming architect Willam Cubbert’s home on his thirty-fourth birthday. Played by Thomas DiSalvo, Cubbert is faced by the looming departure of Tansy—his semi-girlfriend—played by Amy Horan, as well as his increasing dissatisfaction at work, where his boss slowly strips away all style from the architect’s design of the new Regency hotel. Their small party is first crashed by the corporate over-lord in question (played by Herb Poe), along with his son Thor (played by newcomer Caleb Smith), and his wife Clelia (played by Kathryn Barrett-Gaines) and her barely contained ball of neurosis. Joining them is Cubbert’s best friend and Tansy’s ex, the sharp-witted Axel Hammond, played by the director. On top of this tense emotional landscape, Cubbert’s life is further upended by the sudden appearance of Rick Steadman, the mysterious figure that once saved Cubbert’s life in Vietnam, come to collect on a promise. Complete with a thick Mid-Western accent and an impressive lack of social graces, Steadman (played by Dillon DiSalvo) effectively takes apart Cubbert’s careful life piece by piece until Cubbert and his friends are forced to bizarre and drastic measures in an effort to rid themselves of Steadman’s constant interference. 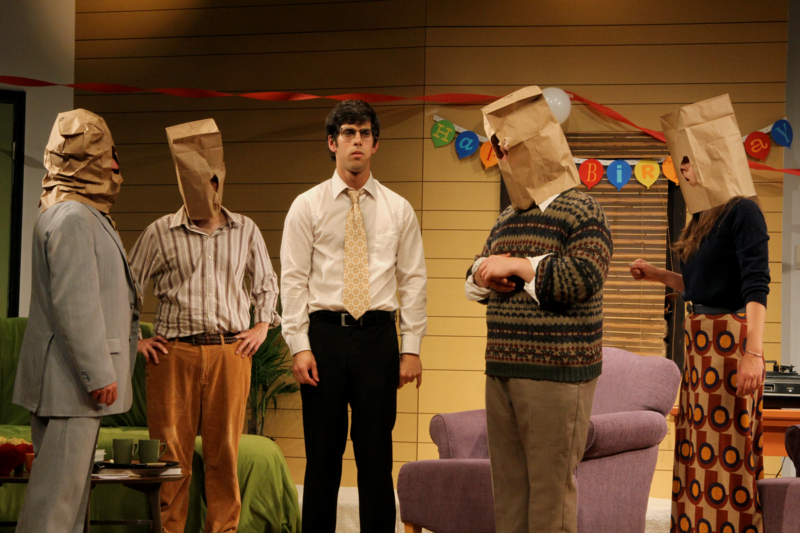 From L-R: Herb Poe as Waldgrave, Frank DiSalvo as Axel, Dillon DiSalvo as Rick, Thomas DiSalvo as Willum, and Amy Horan as Tansy. Photo by Meagan C. Beach. Fans of this company will see many familiar faces returning this year. The three central male characters are played by the three DiSalvo brothers, founders of Parlor Room Theater. The familial connection seems to create an instant comfort between these characters in the rehearsal room. First time company member and long time friend of the brothers Amy Horan observed “how it seemed like we were able to skip a step in the process, jumping over the whole ‘getting comfortable with each other’ phase, getting straight to developing the relationships of the characters”. I sat in for a run of their show recently and can attest to the ease these actors share in the rehearsal process. There is a kind of fluency present that cuts out any self-consciousness, letting the actors play with material with out fear of failure. Parlor Room Theater Company has created a show where the action is constant and the fun is infectious.